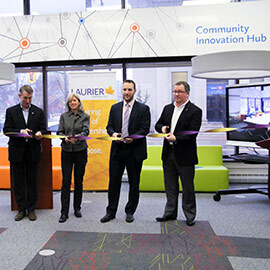 BRANTFORD – On Jan. 17, the Schlegel Centre for Entrepreneurship and Social Innovation at Wilfrid Laurier University hosted the grand opening of the Community Innovation Hub. This newly designed location will be the focal point for all entrepreneurship and social innovation activities on the Brantford campus. The Community Innovation Hub is designed to provide students, staff, faculty, alumni and Brantford community members with a collaborative space to facilitate social innovation and entrepreneurship activities. The Schlegel Centre’s programs, including LaunchPad, Neighbourhood Changemakers and the recent introduction of Start@SIVC, for example, will be facilitated from this location. The programming available through the Community Innovation Hub is strategically aligned with the university’s mandate of ‘inspiring lives of leadership and purpose,’ and supports the broader culture of entrepreneurship and social innovation at Laurier. This innovative approach to experiential learning has been instrumental to Laurier achieving the prestigious AshokaU Changemaker Campus designation. Entrepreneurship and social innovation began on the Laurier Brantford campus in 2015 with the introduction of the flagship program, LaunchPad. Since then, LaunchPad has welcomed 48 participants in Brantford, with notable success stories such as Matt Watkinson with his launch of Joycult fingerboard wheels, and Crossing All Bridges Learning Centre’s social venture, Shredding Barriers. The Neighbourhood Changemaker workshop series began during the spring of 2016 and has empowered more than 30 local community members to come together and solve existing challenges within their city or region with new initiatives. One of the program’s first participants, Edna Malcolm, created activities to address anxiety and depression in her community. The breadth of programming at the Schlegel Centre and the diversity of participants demonstrates the unique opportunity within the Brantford community to impact change at the grassroots level. The Community Innovation Hub was made possible by the generous donation from Wilfrid Laurier University’s Alumni Association.